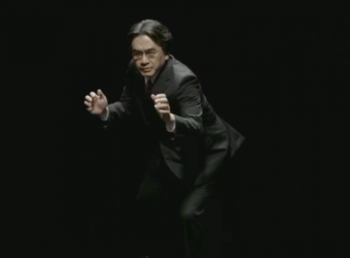 Nintendo top banana Satoru Iwata will stay in Japan for this year's E3. For the second year in a row, Nintendo president and CEO Satoru Iwata will not be in attendance at this year's E3 conference in Los Angeles. However, unlike last year, where his absence was due to health concerns, this year Iwata will stay in Japan to focus on other, non-Wii U and 3DS related areas of business. "Nintendo's focus for E3 this year will be showcasing the many games we have coming for both Wii U and Nintendo 3DS. Mr. Miyamoto and other members of our development team will be in Los Angeles to explain these games and the unique experiences that each offers. Mr. Iwata's focus in this period will be on other areas of our business that require his presence in Japan," Nintendo told IGN in a statement. The "other areas of our business" no doubt refers to the recent mobile gaming partnerships Nintendo has recently fostered in Japan, as well as its mysterious, upcoming Nintendo NX console. Nintendo assures that Iwata will be in "constant contact" with the away team in Los Angeles, and he will monitor the reaction to Nintendo's announcements. While he physically won't be at the show, given that Nintendo's Digital Event is pre-recorded, you can probably count on him showing up in some shape or form for Nintendo's event.